When I went to bed last night, I inadvertently rubbed my arm and felt something crusty and scaly: leftover dough stuck to my body, clinging there despite repeated washing of hands. I shrugged and rolled over, knowing that those dough remnants would soon mingle with new dough the following morning. When I woke, I grabbed the same flour and dough coated jeans and sweatshirt I’d worn the day before, pushing up the sleeves to reveal the small pieces of dough on my arm that I’d felt before bed. Our kitchen is always coated in a fine film of flour. If you visited my house on a Monday, Wednesday, or Friday, you’d witness organized chaos: a dough tub full of a bubbly, sticky concoction. 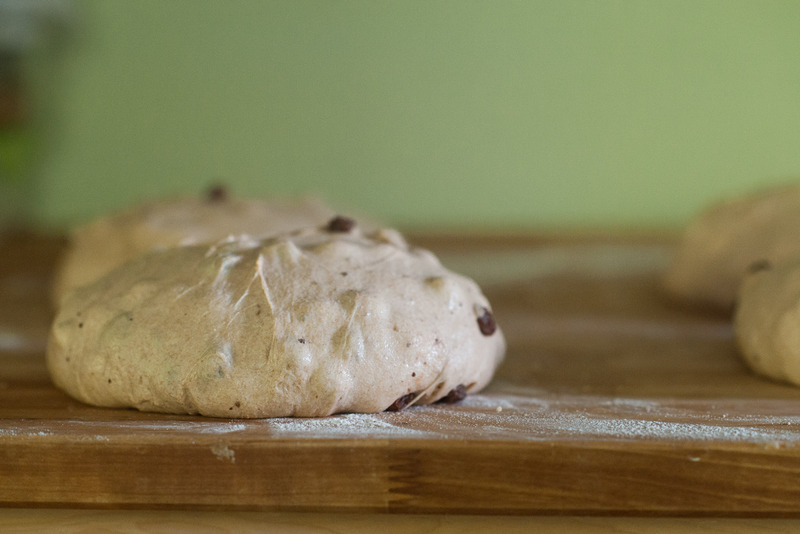 Bowls containing things to add to this dough: toasted seeds, rosemary sprigs, beet slurries. Supple dough orbs (or, as I refer to them, dough bottoms) resting with a tea towel thrown over them to keep them cozy. Bowls containing stubborn pieces of starters and leavens that refuse to budge without serious elbow grease. 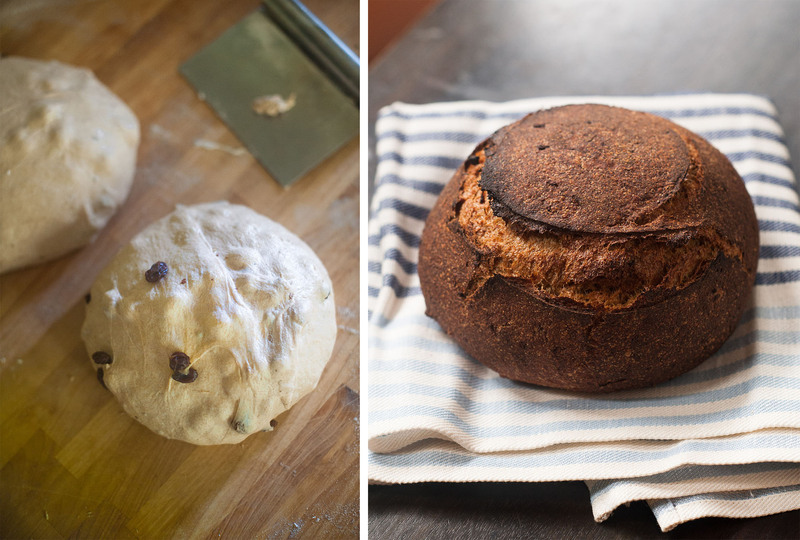 I started baking bread in the fall of 2013, and like other interests that have become passions, I’ve been navigating bread fermentation, shaping, styles, baking methods, and preferences very slowly. Much like photography, food politics, and gardening, from the very beginning, I dove deeply into bread baking. But the learning curves of all of my passions have more in common with scuba diving than with a flashy somersault dive from a springboard. I’m not a dabbler. I didn’t bake a loaf from Ken Forkish’s book – the first book I learned from – nod, and say “good enough” and move on to Tartine Bread. Instead, I established a routine of baking weekly, frequently baking the exact same loaf as the week before, taking notes on time, temperature, and taste differences. These early loaves frequently used commercial yeast instead of a sourdough starter. Before baking sourdough loaves, I needed to understand the science, health, and flavor behind sourdough fermentation, and, concurrently, have eaten enough yeasted breads to be able to compare the two styles of leavening. This interest partially inspired my fermentation series of 2014, and talking to and observing Tabor Bread’s then baker Paola Smith further solidified my intent to make baking an integral part of my life. Smith baked methodically, skillfully, carefully – watching her shape, score, and bake loaves was akin to a Tai Chi routine that she performed daily, each repetition further solidifying muscle memory and awareness. By then, I’d transitioned from baking Ken’s loaves to Chad’s loaves. Chad Robertson, that is. As I’ve written about previously, I have an infinite respect for Robertson as a professional baker. He spent years practicing and learning before opening San Francisco’s Tartine Bakery. 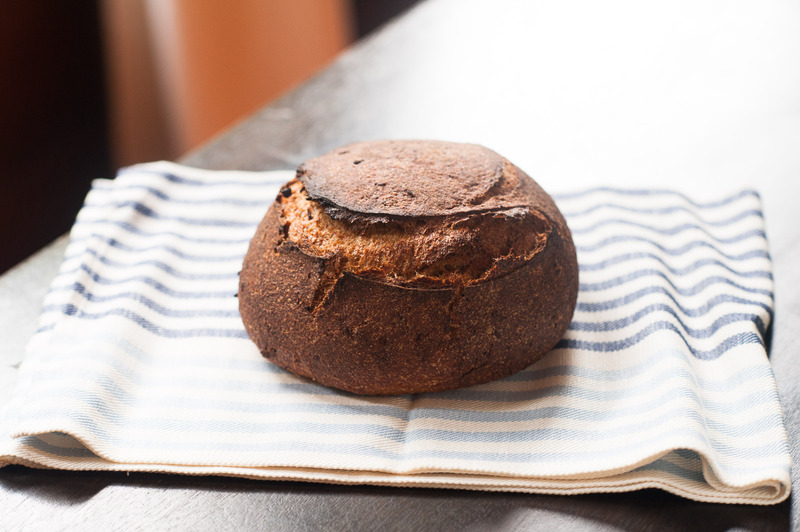 He baked under Richard Bourdon of Berkshire Mountain Bakery, apprenticed in bakeries across France, and then, for years, alone, he pushed himself to understand flavor and to create a consistently delicious country loaf, a loaf with a caramelized crust and a soft, open interior. Often chefs or bakers gain a cult following for reasons beyond flavor (social media prowess, for example). Robertson’s success is entirely built on his country loaves: they’re that good. He could have rested on this success, turned out country loaves for another decade and then cashed out or drastically expanded: a Tartine Bakery in every major city. Country loaves for all! Instead, for years, the bakery’s daily routine and style of bread remained basically the same. Robertson baked a limited amount of loaves in various styles like country, whole wheat, and semolina. His bread and philosophy began to morph a few years ago. No longer content to bake with white and occasionally whole wheat flour, Robertson wanted to apply the nutritional aspects of sourdough fermentation – the breakdown of phytochemicals, the activation of enzymes that aid in digestion, the neutralizing effect on gluten, the appearance of beneficial amino acids and nutrients – to lesser known or ancient and “grandfather” grains like einkorn and kamut. He became driven to create bread that remained delicious, but because of the composition and fermentation techniques, resulted in bakes that were more filling and more nutritious. Today, Robertson is slowly and carefully expanding, bringing these filling and nutritious loaves to more: soon, he and his wife, pastry chef Liz Pruitt, will open a much larger space in San Francisco called the Manufactory, as well as rumored spaces in Tokyo, Los Angeles, and New York City. Inadvertently at first, and now, quite consciously, I’ve used Robertson’s dedicated passion and methodical approach as a guide for how I bake. The transition to Tartine’s sourdough loaves and away from reliable gas-producing commercial yeast (even if it was just a sprinkle) was challenging at first. I remember my first attempts at Robertson’s country loaf resulted in loaves that were pancake flat, loaves that had holes so large that jam simply fell directly through onto my plate, loaves that were too gummy to toast properly. I stuck with it, eventually finding a routine of leaven creation that matched my schedule and house temperature. Months later, once I was fairly happy with the country loaf, I too moved onto breads with a greater whole wheat composition, adding Sarah Owen’s botanically inspired Sourdough into the mix, and finally feeling comfortable enough to tweak recipe timing. 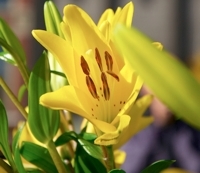 In reflecting on the past three years, I clearly see where I started and have begun to formulate where I want to go. I envision getting to the point where I can tweak a hydration percentage and know exactly what will happen to the bread or when I’ll add a mix-in because I want to, not because a recipe told me to. When I can shape and score and the resulting loaves begin to look more like brothers and less like cousins. I have bigger plans related to my baking, that I’m happy to share at the appropriate time. For now, I’m in the early stages of creating a Community Supported Bread Program. 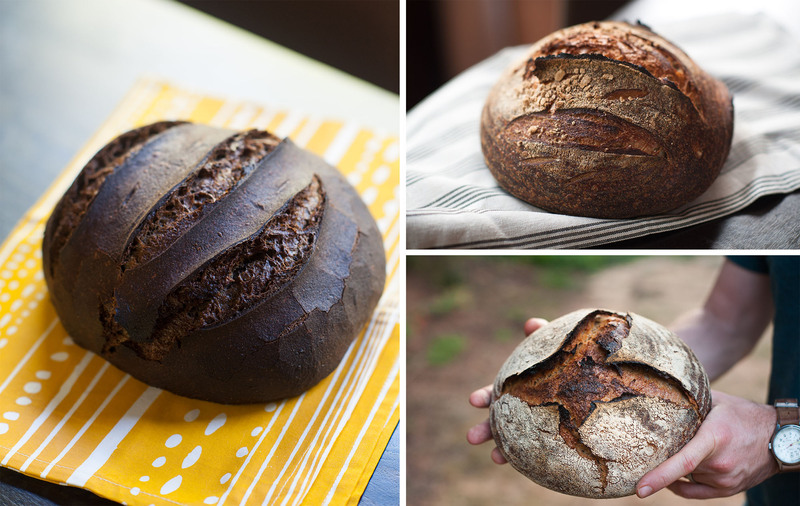 When launched, I will bake weekly for a small group of members, who pay either by the week or month, and who will be able to select from a country loaf, whole wheat loaf, or a rotating style like seeded semolina, rye, or sweet potato. Meanwhile, each baking day, I continue to learn more about shaping, scoring, and specific techniques such as baking on a stone instead of in dutch ovens, when to add steam and how much, and how long different styles of bread take to bake. The learning process is rarely flashy, but like a perfectly toasted piece of rye bread with raspberry jam (my husband’s favorite combination), it’s going to be delicious... and nourishing.